Academy Awards: Won for Best Art Direction-Set Decoration; Best Cinematography. Nominated for Best Sound Recording; Best Score-Edward Ward, 1944. DVD: Standard 1.33:1; audio English Digital Mono; subtitles French; closed-captioned; single sided - dual layered; 18 chapters; rated NR; 93 min. ; $29.98; street date 8/29/00. Supplements: The Opera Ghost, A Phantom Unmasked Featurette; Feature Commentary with Film Historian Scott MacQueen; Production Photographs; Theatrical Trailer; Cast And Filmmakers; Production Notes. While there have been multiple versions of Frankenstein, Dracula, The Mummy and others over the years, their Universal "Classic Monster Collection" DVDs clearly presented the best-known of the bunch. However, that doesn't seem to be the case with Phantom of the Opera. Instead of the 1925 Lon Chaney offering, we find the 1943 remake with Claude Rains. Frankly, I haven't seen the older one, but I'd have to imagine it's better than this dull, tedious tale. The film tales the tale of Erique Claudin (Rains), an aging violinist whose arthritis causes him to be fired from the symphony. Because he's been funding the voice lessons of a young singer named Christine (Susanna Foster), Claudin has no money saved, but he pins his financial hopes on some music he's written. He mistakenly thinks that someone attempts to steal his work and throttles an agent. In the hubbub, he gets acid thrown on his face and he hides in the sewers of Paris while pursued by police. Understandably displeased by this turn of events, Claudin seeks to boost Christine's prospects through a reign of terror, and the police match wits with him as they try to prevent further violence and disruption. This all sounds much more exciting than it is. As staged, Phantom seems fairly boring and tedious, with little spark to fire the project. One problem stems from the fact that Claudin really shouldn't be all that difficult to catch. How does this meek little man all of a sudden turn into a mysterious force of evil who so thoroughly evades detection that many believe he's actually a ghost? I can understand the part about him going nuts, but I can't accept his almost-superhuman abilities. I also found the film slow-paced and monotonous because it focuses far too much on the actual opera. This results in some lovely photography of the opera house - make no mistake, Phantom was a well-shot film that looks great - but it makes the movie progress at a glacial rate. All of that music feels like padding, and though the film runs only 93 minutes, it seems to go on forever. Some useless "comic relief" exists in the form of baritone Anatole (Nelson Eddy) and policeman Raoul (Edgar Barrier). Rivals for the affections of Christine, they also form an unlikely pair who attempt to halt the Phantom. Much of their material is played for laughs, which makes them a) less than credible as forces against Erique, and b) creates an even less-ominous tone in this already too-lighthearted horror film. As for the actors themselves, all are acceptable but none seem particularly compelling. This is especially disappointing in the case of Rains. I've become a big fan of his work; from early roles like The Invisible Man to his wonderful turn in Casablanca to his almost-swansong in Lawrence of Arabia, Rains maintained a consistently solid and compelling screen presence. However, he appears rather dull here and he does little to give the Phantom much of a spark. That wonderful voice of his worked to great effect in The Invisible Man but it doesn't inspire any terror here. Although I have yet to watch The Creature From the Black Lagoon, I'll be shocked if I like it less than I cared for 1943's Phantom of the Opera. No, the film isn't unwatchable, but it's pretty slow-moving and dull, with little excitement or drama to inspire any affection toward it. I'd classify it as the worst of the "Classic Monster" films to date. Since I didn't much care for the movie, that means it's inevitable it'll produce one of the best DVDs of the bunch. 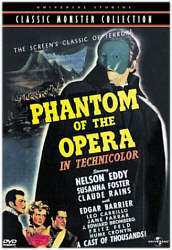 Phantom of the Opera appears in an aspect ratio of approximately 1.33:1 on this single-sided, double-layered DVD; due to those dimensions, the image has not been enhanced for 16X9 televisions. Although not quite perfect, the picture looks surprisingly terrific and easily represents the most attractive image of all the "Universal Monsters" DVDs. Sharpness generally seems fairly well-defined and accurate, though noticeable softness can interfere at times; the fuzziness isn't terribly problematic, but it does occur. I noticed a few mild moir� effects and jagged edges, but nothing serious. Print flaws appear mainly in the form of minor white speckles during much of the movie, but no more significant flaws such as scratches, hairs, grit, tears or grain seem to mar the image; it looks quite clean for such an old film. Although flesh tones seem a little bland, colors are usually wonderfully rich and lovely. From the velvets of the opera house to the blues of the police uniform, most of the hues seem very attractive and lush. Black levels appear deep and dark, with nice contrast, and shadow detail looks appropriately heavy but not excessively thick. Ultimately, the movie offers a simply marvelous image. The monaural soundtrack of Phantom of the Opera is less impressive but it still works well for a nearly 60-year-old movie. Dialogue seems a little rough and thin, but it always appears clear and easily intelligible. Effects are clean and lack substantial distortion. Music can be slightly edgy at times, but it generally sounds smooth and crisp, especially considering the greater-than-usual amount of music in the movie and the complexity of the works. At times I heard some light background noise, but the track usually appeared fairly quiet. It's not a great soundtrack, but it seems more than acceptable for its age. All of the Universal Monsters DVDs feature solid supplements, and Phantom of the Opera is no exception. We start with an excellent audio commentary from film historian Scott MacQueen. He also did the fine track for The Bride of Frankenstein, and his work here is even better. MacQueen packs in a ton of information into the film's 93 minute running time. He goes over the history of the story and other movie productions plus anecdotes about the making of the picture and basic biographies of many of its participants. Altogether it's a very compelling and detailed commentary that provides some excellent information. MacQueen also functions as the host of "The Opera Ghost: A Phantom Unmasked", a fine 51-minute and 10-second documentary about the film. Actually, that should state "about the films", since the show provides surprisingly little information about the 1943 edition of Phantom itself. Instead, we get a strong history of the book and the prior 1925 production plus details about such things as the famous - and still-in-use - set and later Phantoms. In addition to MacQueen's comments as host, "The Opera Ghost" features the usual roster of interview participants. We get film historians like Rudy Behlmer, actors such as Susanna Foster and Turhan Bey, and Claude Rains' daughter Jessica. Their remarks are intercut with a wealth of film clips - from the 1943 Phantom and others - plus production shots and publicity materials. I believe this is the longest "Classic Monsters" documentary, and it's possibly the best, if just because it provides such a wide scope of information about the topic. Speaking of such items, "Production Photos" provides a nice look at a variety of stills from the set and advertising pieces. As is typical for the "Classic Monsters" DVDs, this information is presented as a running piece. The five minute and 45 second program "films" the stills and displays them along with some of the movie's score. I like this method because it's more dynamic than the usual stillframes. We also get the original theatrical trailer for Phantom plus some text information. There are "Cast and Crew" biographies of Rains, Foster, Eddy, Edgar Barrier and director Arthur Lubin, plus some production notes. All of these materials provide brief but interesting looks at their subjects. Finally, "Recommendations" simply shows the covers to the other seven "Classic Monsters" DVDs and alerts us to their existence. My recommendation is difficult simply because I didn't much like the movie. The 1943 edition of Phantom of the Opera provides an intermittently-interesting but generally dull and bloodless retelling of the classic tale; even the presence of the great Claude Rains can't spice up the proceedings. However, the DVD itself is probably the best of the "Classic Monsters" collection; it presents excellent picture plus relatively solid sound and some wonderful extras. I'm happy to own this DVD if just because I've enjoyed the "Classic Monsters" series and I really liked the supplements; fans of the series will doubtless find much to enjoy. Nonetheless, it should fall low on your list of purchases if you haven't picked up the rest of the monster films.